The stem bolts of this TLC Bikes "Metric Titanium" Stem Bolts Kit - Oil Slick are made of light weight but strong titanium. They will fit on almost any stems that uses allen screws with a head width of 10.6mm and a length of 28mm. 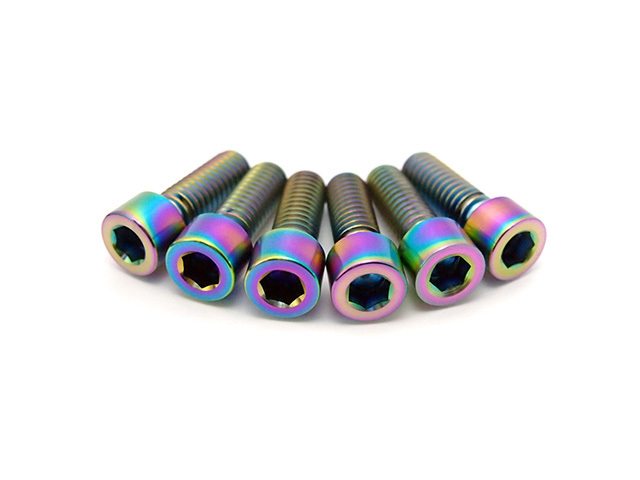 The TLC Bikes "Metric Titanium" Stem Bolts Kit - Oil Slick consist of a set with six allen screws. We recommend the use of anti-seize / copper paste as a lubricant to prevent seizing or cold welding.